* 77 | Pre-views, level help, tips and videos for ALL Facebook King levels! You might want to check out the guide for Bomb Bubbles written in the Level 76 guide! You need luck with level 77, that is for certain, but knowing that there are two bomb bubbles in the ceiling as well also helps. ;) Watch out for triggering them! It feel a little unfair that the bomb bubbles at the very bottom starts counting down in the same moment as you click to shoot a bubble, but we can live with that, right? At least it gives you a moment to think and plan for the level ahead – until you click. The first times I played the level I didn’t realise that the don’t count down before I click, you don’t have to do the same mistake. There are also Bombs at the very top of level 77, so you gain a life by doing even bursts. If you let the bubbles beyond what you see burst, you might detonate a bomb by mistake. 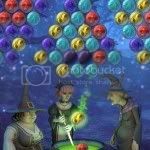 A good idea for getting through level 77 is to stop the bombs with three bubbles from the cauldron. As in the picture to the left. You have nine turns to do this though, so you do not need to stop those bombs directly. If you want to, you can wait until the bubble from the cauldron don’t match any for popping.